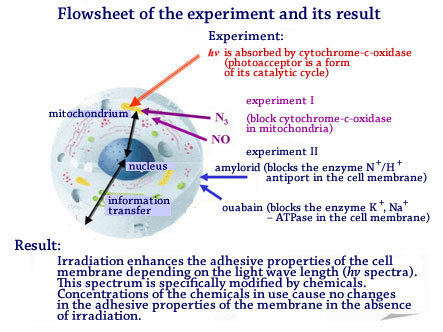 A necessity of systematic study of visible and near-IR radiation effect on the cell was stimulated by the progress in low-intensity laser therapy which is currently performed mainly with semiconductor lasers and light diodes emitting over the range from 650 to 900nm. ILIT RAS has performed studies of the information transfer regulation inside a cell with laser radiation, as well as possible genetic effects of HeNe laser radiation. A new system of signal transmission between the respiratory chain and the membrane inside a living cell has been revealed and partially studied. 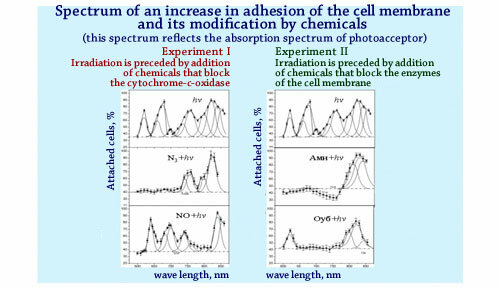 It has been predicted and experimentally proved that there exists a system of information signal transmission between the respiratory chain, the cell membrane and the nucleus, which is regulated by monochromatic light in the visible - near-IR spectra. 1) The obtained results are of fundamental significance for cell biology. 2) The controlled regulation of information transfer by means of laser radiation opens up new possibilities for low-intensity laser therapy.